Blog Book Tours: Welcome to The Corner Cafe Blog Book Tour! Join us for the latest wild and crazy experiment at the BBT Café, the online social group for all the writers who have taken my blog book tours classes over the past few years! This community of about 100 authors supports each other’s writing efforts through daily social media interaction, blog book tours, and by sharing information and conversation as the publishing world changes. And, boy, is it ever changing fast! In the past few years, the opportunities for self-publishing have burgeoned, and the stigma attached is virtually non-existent. Only an Old Publishing School dinosaur would think of self-publishing as an inferior option. Programs like Amazon’s Kindle Direct Publishing have leveled the playing field, and more authors are jumping into the game every day. This fertile publishing ground is what inspired The Corner Café short story collection. We noticed that authors were starting to give away samples and old titles in e-book format, and that it resulted in increased sales on their other titles. Even a free day or two tended to increase sales when the regular price of a title came back. Without too much forethought about what we were stumbling into, we decided to put together a collection of our very own around a common theme: The Corner Café. The object was for readers to sample various writing styles, and tempt them to link to other works by the contributing authors. We’d promote the new project via a month-long blog book tour (what else? ), and track sales each day, as well as measure download bumps the five free days allowed by the KDP Select program. (Seth Godin suggests free is a good marketing strategy in publishing. Here’s his post about it.) So we’re putting it to the test. That’s the short version of how it all came about over the past four months. You can get more gory details at the various blogs listed below throughout June. In The Catfish Enchantment by Marian Allen: Cosmo’s father deserted the family and died unforgiven, his mother is sinking into depression, he’s started cutting himself to relieve the pain, and his boss suggests…a tattoo? In The Eyes Have It by W.S. Gager: Crimebeat reporter Mitch Malone hates going to church, but when he gets rooked into speaking to the Bible-toting ladies, he may be facing the devil himself as he investigates the prayer group's missing purses. In The Consequences of Breaking and Entering by Audrey Lintner, Goldilocks gets an update and her comeuppance. In Perfect Timing by Christine Verstraete, a rescued pup helps Corner Café owner Gina Mason find love and thwart a would-be robber. You can also read the first two chapters using Amazon’s Look Inside feature. If it sounds like something you’d like to download to your Kindle, here’s the link to buy. Only 99 cents! 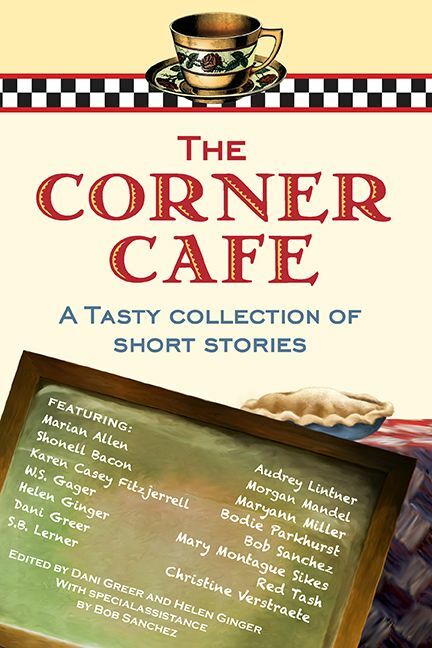 We hope you join us each day to read more about how The Corner Cafe: A Tasty Collection of Short Stories evolved. For those of you out there who know little about how a blog book tour works, a great way to get an education is to follow along on a tour. You'll get lots of ideas for your own blog book tour. Join us and do leave questions and comments here! And so it begins...speaking as a cafe regular (so to speak), this is going to be an interesting and informative month. As a contributor to The Corner Cafe: A Tasty Collection of Short Stories, I'm looking forward to participating in and following what others have to say about the blog book tour. Gosh, this is exciting! I've loved the idea of the Corner Cafe Collection from the start. A special thanks to those of you who brainstormed and carried it off. I'm nervous, too, Shon. I've never published fiction before. Eek! Dani and Shon, your stories are great, so no need to hyperventilate. Speaking of which, I hope our other contributor, Helen, has gotten over her panic attack at the release of her first major fiction.